The EMX BP 10 mini infrared eye has 160 foot range along with advanced controls and indicators. • Wide variety of transmitter and receiver packaging and output options. sensing, reversing, counting, alarm entry and many other applications acceptable to infrared sensing. 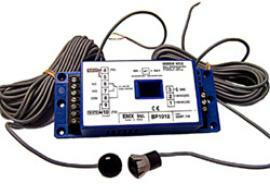 Also available with dual transmitter/receiver with single relay output and dual transmitter/receiver with 2 relay outputs.